18 December 2008, at 8:18a.m. RWANDA - Nearly half of the children in the small, central African country of Rwanda reportedly suffer from chronic malnutrition and at least two-thirds of the population lives below the country's national poverty line. Tyson Foods is to provide technical experts to teach local women to raise chickens. These are among the reasons Tyson Foods, Inc. is working on a unique pilot project in Rwanda with Millennium Promise, a non-profit organization aimed at ending extreme global poverty. Tyson will provide technical experts to go to Rwanda to help women in five Millennium Villages learn how to raise their own chickens. This will enable them to earn an income from the sale of poultry eggs and meat, and develop a school meals program to increase the protein consumption of children. Rwanda is one of the most densely populated countries in Africa and is landlocked with few natural resources and minimal industry. The 1994 genocide of hundreds of thousands of Rwandans severely damaged the country’s already fragile economic base. The country has since been working with the international community to generate social and economic development. Tyson’s involvement with Millennium Promise began in January 2008, when the company’s Jenise Huffman went to work for the organization on a nine-month corporate service fellowship. She provided her knowledge of strategy, marketing and business development with the Millennium Promise staff and also traveled to Africa. If the Tyson pilot project is successful, it will be expanded to help people in other Millennium Villages in Africa. However, other than providing consultation, Tyson Foods presently has no plans to be involved in commercial chicken production there. 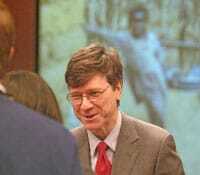 "We're very excited about Tyson's enthusiasm to help with this important initiative," said Dr. Jeffrey Sachs, president and co-founder of Millennium Promise, who spoke to Tyson managers Tuesday at the company's world headquarters. "The involvement of partners like Tyson Foods boosts the efforts of the Millennium Village project to help rural African communities lift themselves out of extreme poverty."